At this unusual property in southern England, you can sleep within a whisker of a ferocious predator, said Sally Peck in The Daily Telegraph (U.K.). 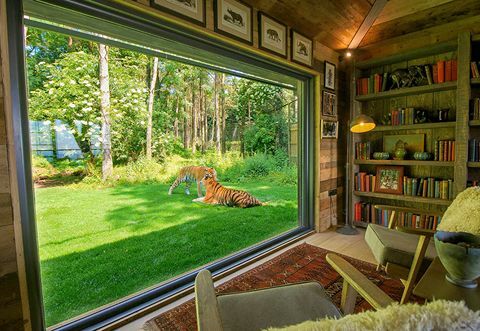 Set inside the tiger enclosure at Port Lympne wildlife preserve, the two-bedroom Tiger Lodge has giant—and reassuringly thick—glass walls that are all that separate you from two big cats. A tigress named Ingrid was napping 3 inches from the bedroom window when our family arrived. My husband and I were soon sipping aperitifs while studying the unique markings of her fur and the rise and fall of her enormous belly. Adventure cruise operator Hurtigruten is marking its 125th year by discounting select voyages by up to $1,250. A 17-day Greenland cruise that departs Copenhagen July 30 now starts at $12,023 per person, double occupancy. Book by March 31. Save $1,114 on Peregrine Adventures’ 18-day “Peru Explorer” package, which includes visits to Machu Picchu and the Paracas National Reserve. The tour departs March 17 and costs $4,456 per person, double occupancy. All this month, book a stay at the Margaritaville Resort and Marina in Key West, Fla., and enjoy fifth nights free plus a $100 resort credit. With the discount, a mid-March stay in a standard room costs $359 a night.